This blog post addresses one particular issue related to ADF Bean Data Control: how to refresh. The readers which are not yet familiar with Bean DC might refer for example to the tutorial Using Bean Data Control or this video Working with the ADF Java Bean Data Control by Shay Shmeltzer to get an overview about a usage of it. 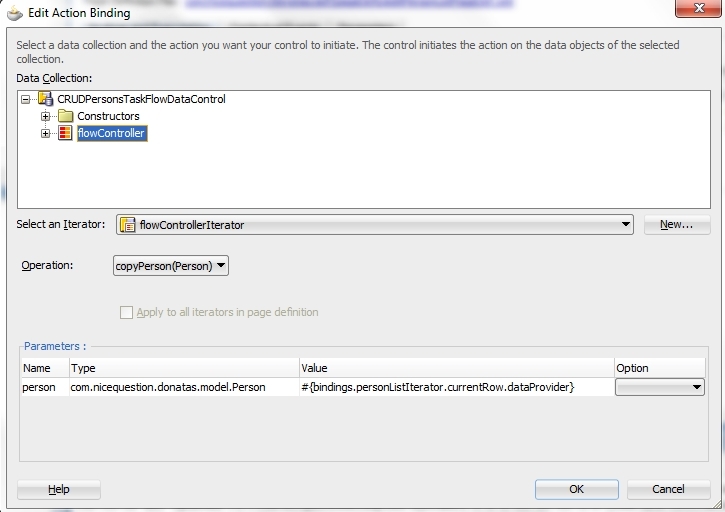 Just to remember: Bean Data Controls allow to create data bound pages based on data provided by plain java objects. ADF Data Controls provide an access to data through binding layer a unified declarative way regardless of implementation details. One of built-in aspects of binding layer is caching: you might already noticed one property of Iterator (visible in Property panel when Iterator is selected in a page definition): Cache results: <default> true. It is an expected behavior in most of the cases which results in performance gains and is provided by ADF framework by default without an additional development efforts. In case the data behind a Bean Data Control is modified in java directly an additional development step is needed to refresh an appropriate iterator and get the result of modifications visualized in UI component based on the iterator. 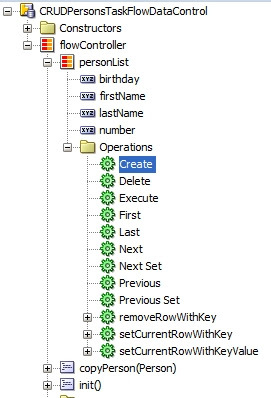 This blog post provides an example of this issue and shows one simple technique of "how to refresh without side effects" - not loosing some other functionality of the framework, like current row - for Bean Data Control. 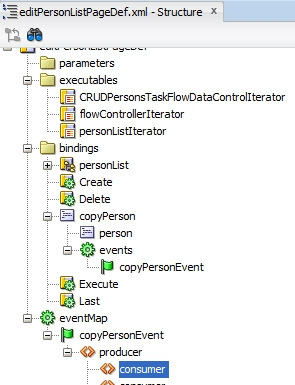 The sample application, available to download and run in it JDeveloper R2, is simple in memory implementation of CRUD+ use case for ADF table based on Bean Data Control and java collection of domain objects (in our case collection of Persons). 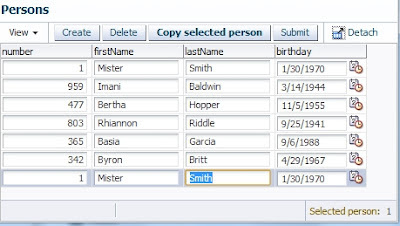 The symbol + stands for extension of CRUD with "copy Person" functionality in order a) to create new Person based on selected one in a table and b) to show how to refresh an iterator (personListIterator) after a new Object (Person) is added to a collection in java. Lets take a look at the sample application in order to better understand the issue with refresh first. The buttons Create and Delete are based on standard ADF Operations (created by Drag&Drop) - nothing exciting, it just works. 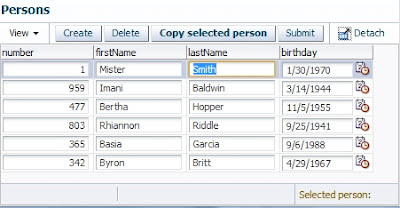 The button Copy selected person was created by D&D of copyPerson method from data control into a page and providing a currentRow.dataProvider of personList iterator. Note: recent blog post of Depac C S shows an alternative ADF java API based way of how to create table rows based on existing row content. 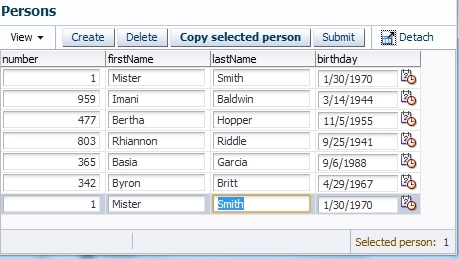 Our sample behaves almost like expected at this time: one click on create button and new empty row is created, by issuing a click on delete we delete a selected person from a list. 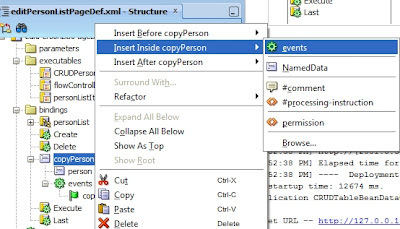 The refresh issue shows up on using a functionality of copyPerson: we click on a button Copy Selected Person, method copyPerson in flow controller java class gets executed, we get the person selected as input in a java method, create new instance of domain object Person using copy constructor add the instance created into personList. 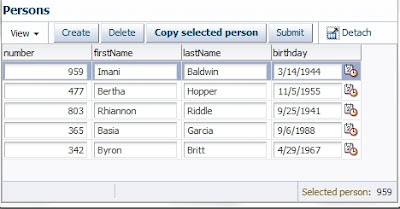 Expected result: the table contains one person more - a clone of a selected person. Actual result: nothing. Everything looks the same like before issuing a copyPerson action. The table on a page is not refreshed automatically after doing a modification of data behind it in java. It shows old (cached) data of personList. 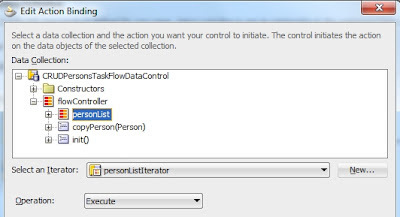 We need to take care about "refresh" by issuing an execute on personList iterator to align the contents of collection represented in java and cached also as peronListIterator previous execution result. Now we just only have to issue this Execute action after the execution of copyPerson in order to "renew" the content of personListIterator. 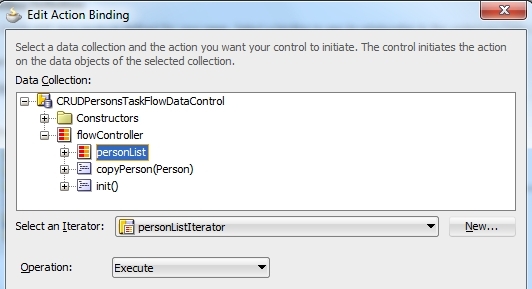 Subscribing an Execute action of personListItertor as listener of it. 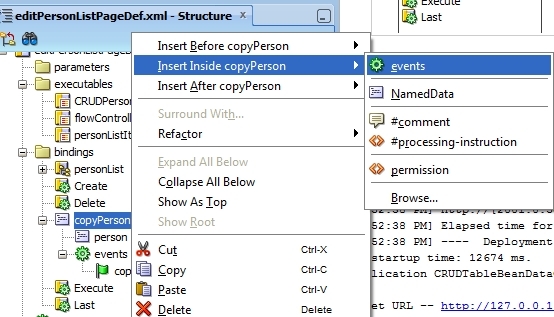 The event copyPersonEvent gets fired once copyPerson action is executed. There are no subscribers for the event at this stage. 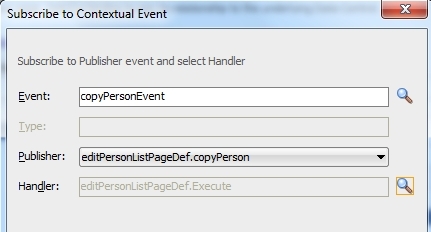 Lets subscribe an action Execute of personListIterator to listen to the event to renew the iterator content. 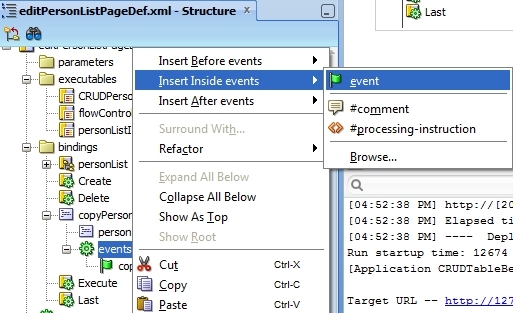 A new Element Event Map gets created as a result , containing a list of subscribers to contextual events. 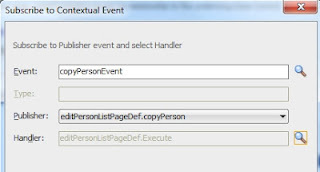 As a bonus for this blog post - additional action binding for the built-in operation Last of personListIterator was created and subscribed to the same event. 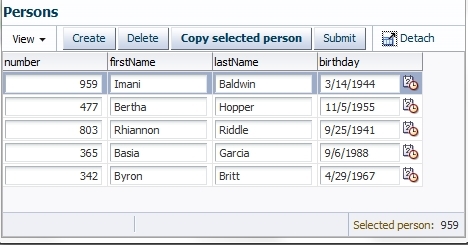 It shows that more than one subscriber to the event can be defined and provides one use case of this feature: to position a current row on a person copied in table on a page. The steps already described in previous chapters were used. Click on Submit. New instance of Person object gets added to the collection of persons. 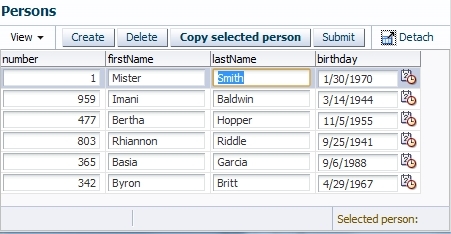 Our Mister Smith is cloned and displayed at the end of the table (execution result of copyPerson, fire copyPersonEvent , Execute on personListIterator as subscriber for copyPersonEvent). 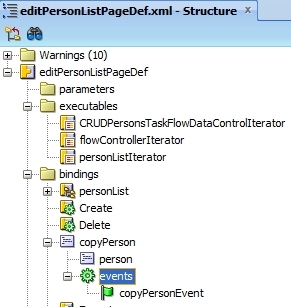 The plain java code of flow controller is supposed to facilitate an easy reading , testing out of context (no dependencies to additional APIs) and understanding of it - it is an important aspect of every enterprise system regarding (usually) a long lifecycle of them. The sources of the sample application are provided at github. Check also ADF EMG Samples page for additional sample applications covering broad range of ADF.